A Friend in Need, Deserves a Pie Indeed! Hello Thanksgivers! 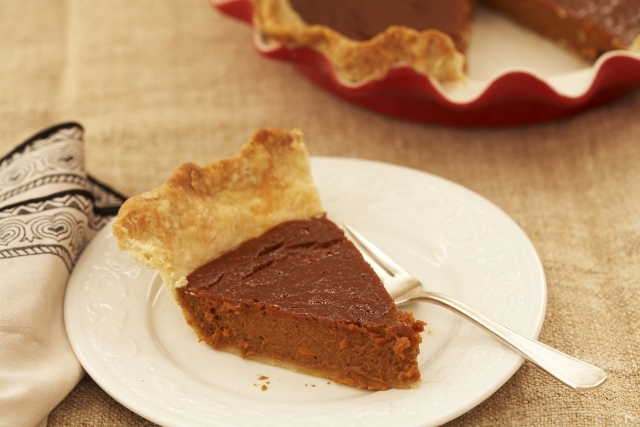 Fat Toaders here to share some of our favorite pie recipes for this holiday season! Pick one or four of these delicious recipes to finish off your amazing Turkey Day Feast. All of these recipes wouldn’t be complete without some of our mouthwatering Goat’s Milk Caramel Sauces so make sure to stop by our online store to pick up a few jars to complete these recipes and of course we won’t tell anyone if you save a couple jars for yourself! P.S. I would TOADALLY recommend our EPIC CARAMEL JAR for some serious baking this holiday season! 1 Bottom Pie Crust (in a pie pan), keep refrigerated until ready to use. 2. Place chopped pecan halves onto a baking sheet, and bake for 5 minutes or until toasted. Pecan halves are toasted once the air smells nutty and the pecans have turned a shade of dark brown. 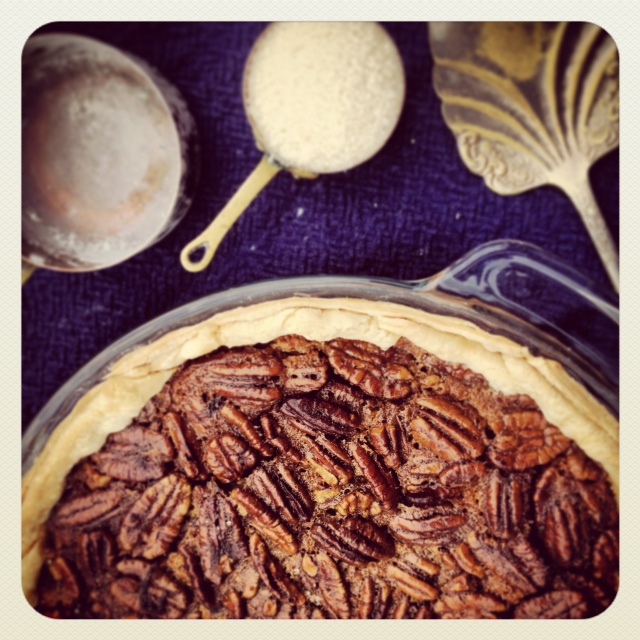 Remove pecan halves and allow to cool. 3. Combine cooled, toasted pecan halves, light brown sugar, and salt in a medium bowl. Mix until combined. Add melted butter. Using your hands or a wooden spoon, mix until combined. Set aside. 1. Combine pumpkin, evaporated milk, and eggs in a medium bowl. Mix until combined. 2. Combine light brown sugar, flour, salt, cinnamon, ginger, nutmeg, and allspice in a separate, large bowl. Mix until combined. 3. Pour the wet ingredients on top of the dry ingredients. Using a whisk, mix until combined and no lumps remain. Set aside. 2. Remove the bottom pie crust from the refrigerator. Par-bake the bottom crust by lining the crust with parchment paper and fill it to the brim with pie weights (or dried beans!). 3. Bake the weighted pie for 15 minutes on the bottom rack. 5. Pour pumpkin filling into par-baked pie crust. Return to oven for 35 minutes. 6. Rotate pie and bake for an additional 15 minutes. If the filling is set, remove the pie from the oven and continue on to step 7. If the pie is still wobbly, return to the oven for 10-15 minutes, until set. 7. 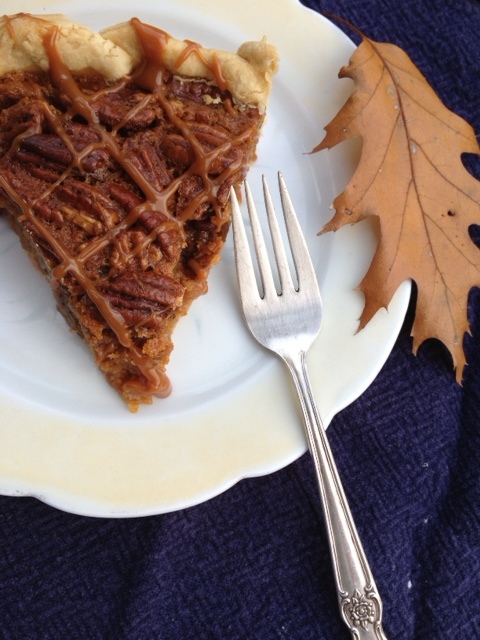 Using your hands, evenly sprinkle the praline pecan topping over the entire surface of the pie. 8. Return the pie to the oven. Bake for an additional 15 minutes. Remove it from the oven and allow to cool. 9. As the pie cools, drizzle Fat Toad Farm Maple Caramel over the top of the pie. Serve pie warm or cold with whipped cream. This pie will last in the refrigerator for up to 7 days. Buy Fat Toad Farm Caramel online at our farm store! 1. Combine the heavy whipping cream and Fat Toad Farms Salted Bourbon Caramel in a stand mixer. 3. Using a vegetable peeler, shave chocolate directly from the bar over the whipped cream and serve. This pie will last in the refrigerator up to 3 days. Preheat oven to 400 degrees F. Use your fingers to work the flour and powdered sugar into the cold butter/lard until you have a relatively uniform, crumbly mixture. Make a “well” in the middle of the mixture and pour the vinegar plus 1 T. ice water into the well. Use one finger to incorporate the liquid, starting from the center of the well and working outward. Add ice water 1 T. at a time until you have a dough that holds together in a ball, but does not stick to your hands. If it is too crumbly, add ice water 1 t. at a time. If it is too sticky, add flour 1 T. at a time. This dough can be made ahead of time and stored in the refrigerator for several days, or in the freezer for several weeks. Form the dough into a disk and roll out on a floured surface. Place the crust into a greased 9″ pie dish and prick the bottom several times with a fork. Mix the brown sugar, white sugar, salt and melted butter. Add the boiling water. Stir until sugar and salt dissolve. Add the beaten eggs and milk, and mix well. If you want a very boozy-tasting pie, add 1 1/2 t. bourbon. Otherwise, add 1 1/2 t. vanilla extract. I prefer the bourbon. Mix in the pecans. Spread 1/4 c. caramel on bottom of prepared crust. Heat up the caramel first if it helps to spread it. Pour the filling into the crust and bake at 400 degrees F for 10 minutes, and then reduce the heat to 350. Bake about 30 minutes more, or until the pie puffs up, and a knife inserted into the center comes out relatively clean. Cool the pie for at least two hours. Before serving, drizzle about 1/4 c. more caramel on top. It helps to heat up the caramel for this step as well. Try putting it in the microwave for about 20 seconds. Cakes: Preheat oven to 350°F. Whisk together flour, cocoa, baking soda, and salt in a bowl. Beat together butter and brown sugar in mixer at medium-high speed until fluffy, then add egg, beat until combined. Add flour mixture and buttermilk alternately, mix until smooth. Spoon 1/8-cup mounds of batter onto greased baking sheet, 2 inches apart. Bake for 11 to 13 minutes. Allow to cool. Filling: Beat together butter, confectioner’s sugar, marshmallow, and caramel in a bowl with electric mixer at medium speed until smooth. Refrigerate for at least one hour. Assemble: Spread two tablespoons frosting between cake tops and bottoms.